There are lots of mindless games on the iPhone, and we feel it's time to stimulate your brain for a bit. In the vain of locomotive puzzlers and other pipe-works derivatives that have you connecting various pieces of track to reach the end of a tunnel, Aqueduct combines thoughtful, maze like elements and environmental manipulation into one neat package. The goal of the game is to connect various pieces of pipe to complete a 'circuit' between the faucet and a drain. Although the object of the game is simple, various barriers such as walls, pits, teleportation things, gates, and other hazards will impede your path. Though the first level (each level contains lots of puzzles BTW) is quite easy, later levels can be difficult if you don't use your head. There's always a clear path and no time limit, so as long as you can think things through, success should be guaranteed. I can't see there being much replay value once the game is finished, but it stands out from the numerous button mashers, shoot 'em ups, and sports games that illuminate the iPhone. 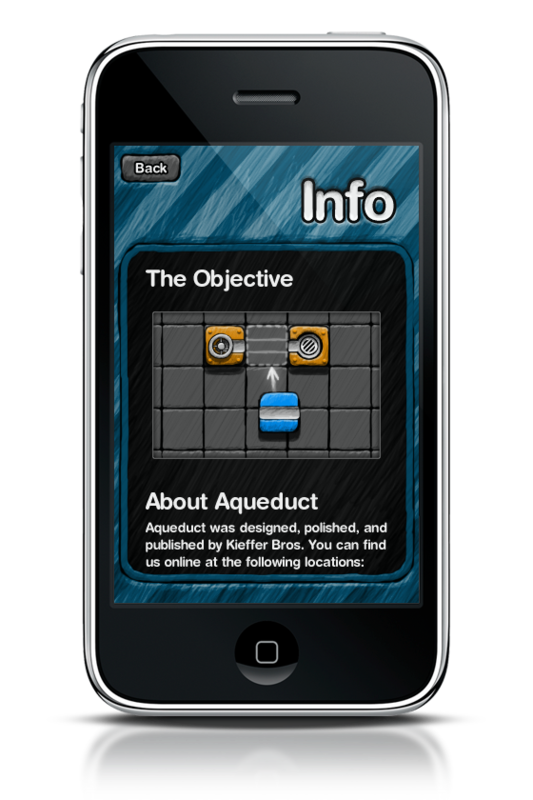 For a particularly smart and beautiful brain teaser, Aqueduct can be had for only $2.99 on the iTunes App Store.